There is only one way to repair electronics-with a soldering iron. Maybe you want to build your own headphone amplifier. What to do with a broken microphone cable or guitar cord? Don’t throw it away! Make the simple repair and save a ton of money. Soldering irons have also found uses in non-electronics projects too. 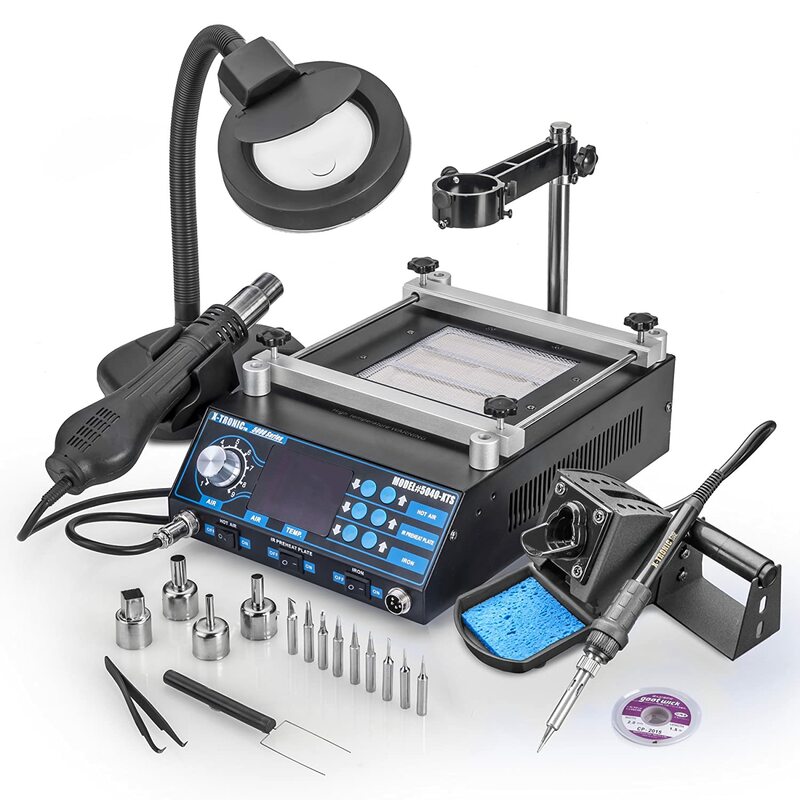 The more advanced soldering iron kits include a hot knife tool for cutting and shaping foam boards, wax, soaps plastics, Styrofoam and even fabrics. 3D-printed components can be shaved and milled for a smooth finish. Soldering irons have also been used to burn patterns into wood and leather. What is the best soldering iron for your projects? It depends on the type of work you plan on doing. We compiled a list of The Best Soldering Irons for 2017, making it easy for you to decide. This basic soldering iron features a replaceable copper tip and fast warm-up time. The J&L soldering iron heats up to 860 degree F. The J&L model is best soldering iron for kids electronics projects and simple repairs. It can be also used for wood burning. UL-rated. The TasiHome soldering iron kit is a step up from the J&L soldering iron. The advanced circuitry maintains a more even temperature. This insures the tip does not cool down, making soldering harder or causing poor bonding of the solder. The temperature adjustment knob is located on the handle. 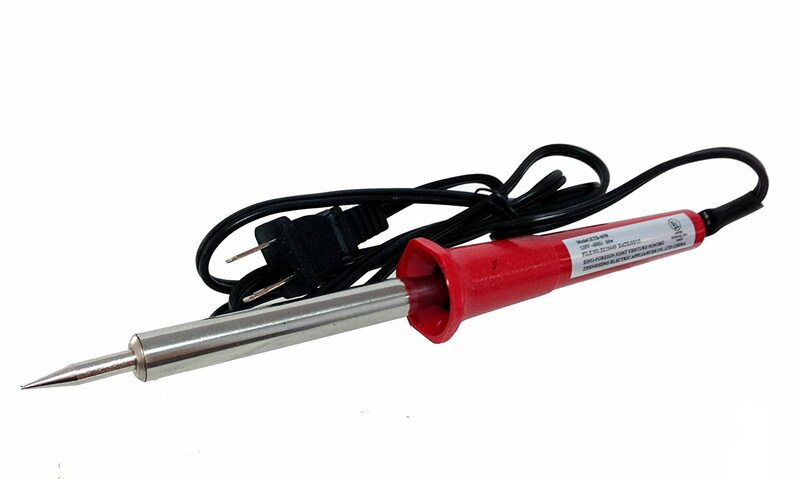 Heat range is between 392 to 842 degrees F. The TasiHome soldering iron comes with a grounding clip. This prevents accidental electrostatic discharge from damaging a circuit board. Comes with three different tips for soldering or wood burning. Looking for a more advanced soldering iron? The Vastar 60 watt Soldering Iron Kit has an advanced Chip Fixed Resistor heating system for more stable temperatures at the tip. The handle will always remain cool even when soldering at high temperatures. The temperature control is located on the handle. A LED light indicates when the soldering gun is active. A small stand will support the hot iron while you adjust the work-piece. Five different tips, including a cutting tip, are included. This kit even comes with solder so you can start working right away. 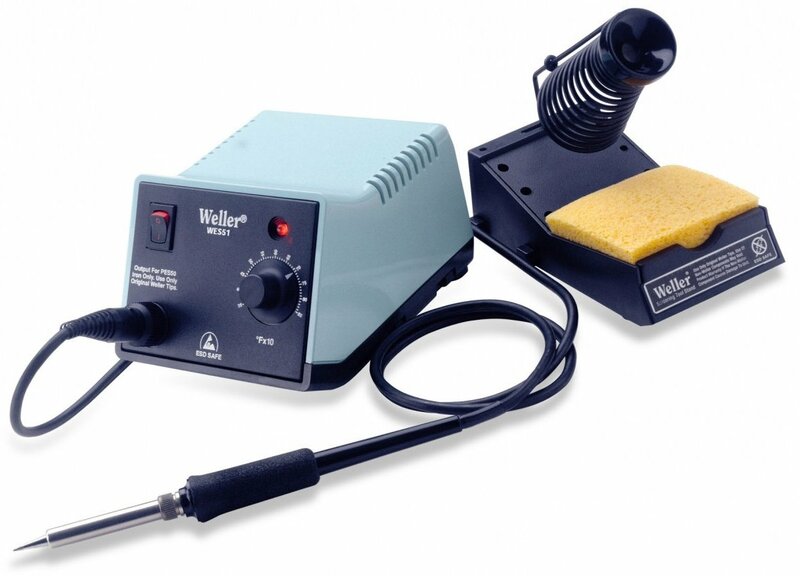 This Weller soldering gun is a professional-grade workstation. The base provides an analog temperature control dial. Temperature range is 350°F – 850°F. The tip temperature can be locked-in, so accidental over-heating cannot occur. The LED power indicator will be “Green” for normal operation or “Red”, if the temperature is “Locked”. The tip is also grounded insuring safe soldering on electrical circuitry. The soldering wand has a pencil tip. Other Weller tips are available. The kit comes with a cradle and tip-cleaning sponge. If you are looking for the very best soldering irons, take a close look at the X-tronic work station. It combines traditional soldering and hot air reworking capabilities. Experienced electronics technicians use hot-air soldering I order to pinpoint the right amount of heat, exactly where it needs to be. If you want to duplicate the OEM assembly and re-work specifications, hot-air soldering is the only way to go. The Samsung Microcontroller insures accurate temperature control. The soldering iron has 70 watts power. The air gun has 500 watts capacity. This kit includes ten tips, four air tips plus the delicate tools needed for fine electronics assembly. The X-Tronic XTR-5040-XR3 is the best soldering iron option for advanced users. This kit comes with a one-year warranty. Solder is a low melting point metal comprised of tin with some copper or silver added. In the past lead solder was common. Breathing in lead is bad for you. Lead-free solder is labeled as such or contains the designation RoHS (Restriction of Hazardous Substances Directive). Solder is used to bond two pieces of metal together. One of the most common uses of solder is the construction of circuit boards and joining of wires. Solder comes in various thicknesses. Thinner solder is better for smaller soldering jobs. Flux core solder has a special chemical inside the solder to help it flow and stick to the metal parts. In order to melt the solder and get it to flow and coat the two pieces of metal, it needs to be melted. A soldering iron is designed to transfer heat from the iron and onto the pieces of metal. When the metal is warm enough, solder is touched to the hot pieces of metal and melts. The soldering iron is taken away so the pieces and solder can cool down. This allows the solder to solidify, joining the pieces securely. Hot knife cutting is used to cut through synthetic materials like Styrofoam, foam-core, nylon webbing and rope and more. The cutting blade screws into the soldering iron in place of the regular soldering tip. The benefit of hot cutting is no force is required. The hot knife just glides smoothly through the material. The heat can also seal the ends of the cut material. This is especially helpful when cutting nylon straps and ropes. The best soldering irons come with a cutting blade attachment. Wood-burning (Pyrography) is an art form that uses various soldering tips like pen to draw on wood. But instead of laying down ink, the wood is precisely burned in order to control the darkness, pattern and depth of the burn. The best soldering iron for wood burning art come with a variety of interchangeable tips. 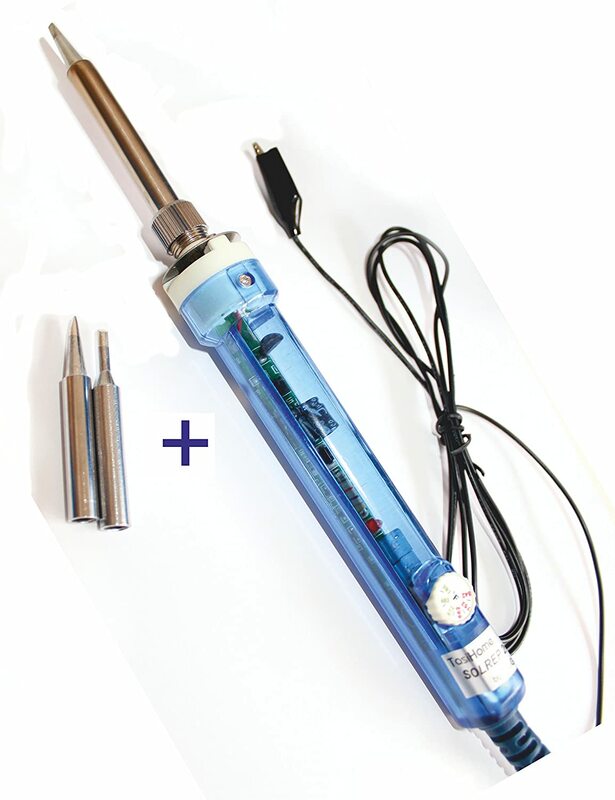 The most basic soldering iron consists of a heat-resistant wand with a soldering tip on the end. Simply plug the soldering gun into a power outlet, allow the iron to warm up for a few minutes and start soldering. The wand should be thick enough to insulate your hand from the heating element. This simple design is the best soldering gun for simple projects and learning how to solder or wood-burning projects. More advanced soldering guns have a temperature adjustment control. This allows you to raise or lower the tip temperature to better match the thickness and melting point of each solder. High-end soldering irons come with a separate power supply and temperature controls along with a temperature display. 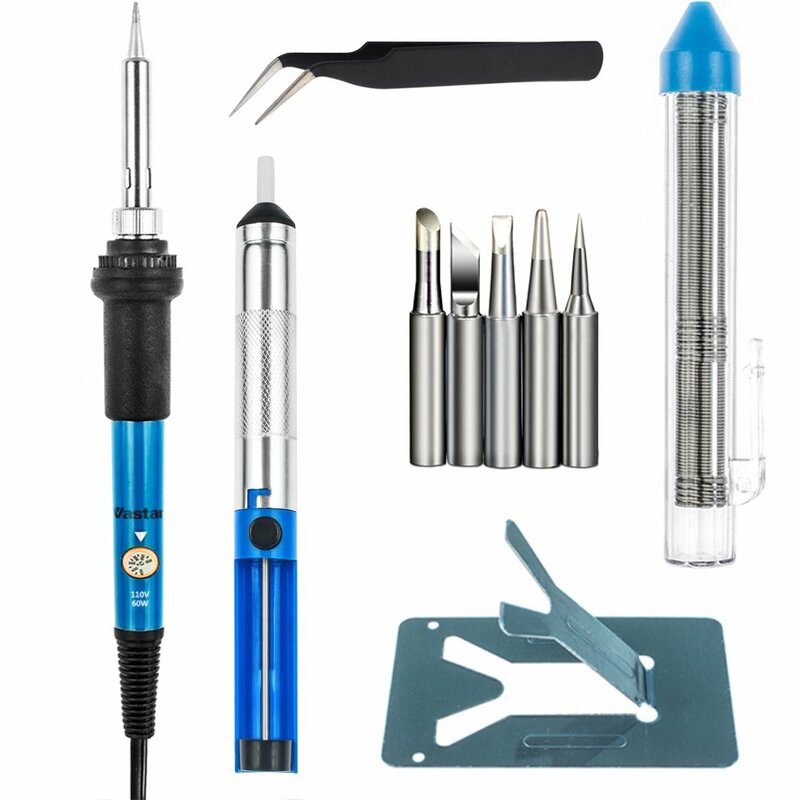 If you plan of doing a lot of soldering work, the best soldering iron will also have a wand holder or cradle that safely holds the hot gun while you prepare the project for soldering.